Congratulations, you’re getting married! But wait a minute, what’s that? Is it the sniff of autumn in the air? In which case, there’s no time to waste, you need to plan your wedding day outfit now! From fantastic florals to feathery wedding dresses, here’s the lowdown on next year’s biggest bridal trends, plus tips on how to get the look on your special day. Bold flower patterns are everywhere right now, from high street clothing to floral designer scents, and next year’s wedding dresses are brimming with flower power too. Vera Wang’s Spring/Summer 2019 collection is awash with colour and over-sized floral motifs. Slim upper body silhouettes flow into billowing skirts made of layer upon layer of delicate hand-wrinkled tulle. While colours echo pretty wildflowers, with shades of peach and violet, plum, ochre and poppy red. If wearing colour feels a bit much, floral patterns also feature strongly in 2019 wedding dress fabrics. Designers are incorporating flowers in lots of visual ways – scattering clusters of white or cream flowers over dresses, decorating hems and waistlines with organza and satin flowers and dotting lace applique flowers down ballgown skirts. Incorporating flowers doesn’t mean changing your dress design, there are lots of subtle ways to integrate florals, for example a floral lace veil or adding a waist-cinching bridal belt or sash . Beautiful paired with lace and plain wedding dresses, our Constance and Florrie wedding belts comprise ivory organza and lace flowers. For the complete look, choose a matching bridal hair wrap and bridal cuff in the same design. For a bolder take on the floral theme, our rose gold Kate wedding belt with pearl and crystal flowers adds a dash of elegant sparkle. Flower crowns also make timeless bridal headpieces. Real flowers tend to wilt so fake-it instead. This Blossom flower crown with dusky pink roses and poppies is a fresh take on a traditional crown. 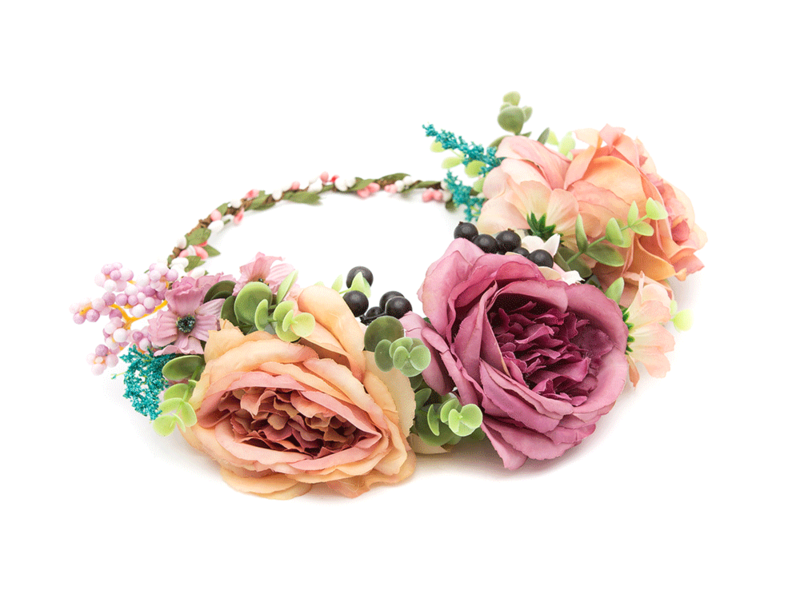 Or to make a statement, try the Bonnie flower crown crammed with big and blousy blooms. Usually reserved for decorative edges and trims, feathers are appearing all over bridal dresses and skirts. Feathered wedding dresses are a bold, theatrical look, so if looking like emu isn’t your thing, pluck it and try some feathery finishing touches instead! Add a co-ordinating marabou feather trim to your bouquet – marabou are the super soft, downy feathers – or weave some pretty feather hair accessories into your hairstyle. Our gold-plated Amelie feather hair clips embellished with crystals look beautiful holding soft waves away from the face. 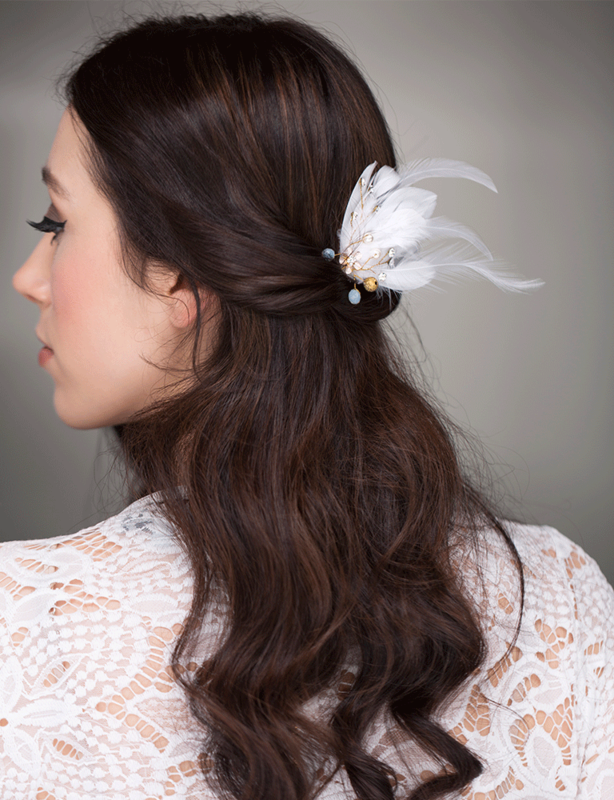 Our best-selling Elizabeth feather hairpin is also stunning pinned above a bridal bun or tucked into a half-up half-down hair style. The royal wedding of the Duke and Duchess of Sussex has had a big influence on next year’s wedding styling, especially the bride’s dazzling diamond headpiece. At Spring 2019 Bridal Fashion Week, tiaras were most definitely the bridal hair accessory of choice. The beauty of a tiara is not only its iconic look – a classic tiara never dates – but its versatility, complementing a wide variety of hairstyles and veils. Tiaras set off chignons, buns, braided and long, loose hairstyles beautifully making it the go- to bridal headpiece. Fans of classic wedding tiaras will love our award-winning collection. There’s an array of styles to choose from and each piece is hand crafted, ensuring absolute attention to detail. For a tiara similar to Meghan Markle’s platinum headpiece, there’s the statement Harper tiara encrusted with eye-catching crystals. Or for subtle shine, try the petite Skye tiara adorned with pearls and white roses. This is a huge hit with outdoor and country wedding brides who want a more relaxed ‘boho’ tiara.